Recently it has been pointed out to me that the Wikipedia TurboGears page was pretty outdate, so I ended up reading and updating a few sections. As that page reported a “2.x Components” section where Pylons was listed, I wasn’t sure what to do as it is not a component of TurboGears anymore since 2.3. Should I create a new “2.3+ Compoenents” section? Should I explain that it was used before? Then I realized that many people probably don’t even know that it got replaced and that gave me the idea of writing a blog post about the TurboGears2 Minimal Mode which is what replaced most of the Pylons functionalities in 2.3. For people that didn’t follow TurboGears recent evolutions, the Minimal Mode is actually a micro-framework like configuration of TurboGears2 which has been available since version 2.3. Minimal Mode was actually created as a side-effect of TurboGears becoming independent from Pylons while the team was also working on a major framework speed-up. Apart from the speed gain and opening the way to Python3, through Pylons removal, Minimal Mode proved itself to be quite convenient for rapidly prototyping Apps, HTTP APIs or showcase small examples. This is particularly visibile through the various Snippets that got created in Runnable.io TurboGears category. The new internal core made possible to greatly reduce dependencies to those that were really needed. Removing a few and moving some, that were only needed when special features were enabled, to the application itself. By default TurboGears2 starts in full-stack mode, expecting the application to reside in a python package and enabling all the features that are commonly available to TurboGears2 applications. For backward compatibility reasons, minimal mode must be enabled explicitly through the minimal=True option. This ensures that all the apps created before 2.3 continue to work while the framework can be used as a micro-framework with minimum effort. Another requirement is that the root controller must be explicitly passed, as TurboGears looks for it in the application package, and as we have no package configured it won’t be able to find any. print "Serving on port 8080..."
If people need additional features that TurboGears usually provide like sessions, caching, authentication, database, helpers and so on… they can enable them with a bunch of options available through the AppConfig object and only in that case additional dependencies like Beaker or SQLAlchemy are required. The recently released 2.3.7 explicitly worked on making minimal mode easier to use, especially when database is involved. Before 2.3.7 you were required to have a package for your application from where the model could be imported, but now the model can actually be any object that exposes an init_model function. The TurboGears tutorial actually uses a Bunch object which is in fact a dictionary. As not many people, even in TurboGears community, were comfortable with minimal mode I hope this post clarified a bit what it is minimal mode and how you can benefit from it. DEPOT is a file storage and retrieval framework we created to solve the need of switching different storage systems when deploying in different environments. We wanted a unique and cohesive API that made possible to keep storing files the same way independently from where they were actually stored. As systems evolve and change during time we also wanted the ability to switch those storages whenever required without breaking past files or changing any code. That lead to various features of DEPOT that specifically pointed this problem, the last of this list is the new Storage Aliases support. If you used a single storage, myfiles, registered as the default one, when you wanted to switch from Local Storage to S3 that was easy, you could register a new mys3files storage on S3 and switch the default one to be that one. Your old files would continue to be served from the old storage and your new files would be uploaded and served from the new storage, because the system knew that some files were saved in myfiles and some were on mys3files. This would correctly store all your user avatars on the avatars storage. But what happened when you wanted to switch your avatars storage from saving files on disk to saving them on S3? Because in this case DEPOT knew that all your avatars were on the avatars storage, you had to put your system on maintenance, manually move all the files on S3, switch the avatars storage configuration and then restart your application. This lead to downtime and wasn’t very convenient. and whenever you stored a file on avatars it would actually be stored on local_avatars. And all your avatars will now be stored on S3 while the old one continue to be served from the disk as DEPOT knows they are actually on local_avatars. This is a pretty simple and convenient solution that perfectly solved our need introducing the ability to evolve your storages forever as far as you only stored files on aliases and never directly on the storages themselves. TurboGears2.3 has been a major improvement for the framework, most of its code got rewritten to achieve less dependencies, cleaner codebase a cleaner API and a faster framework. This resulted in reduction to only 7 dependencies in minimal mode and a 3x faster codebase. While those are the core changes for the release, there are a lot of side effects that users can exploit at their benefit. This is the reason why I decided to start this set of posts to describe some of those hidden gems and explain users how to achieve the best from the new release. The first change I’m going to talk about is how the response management got refactored and simplified. While this has some direct benefits it also provided some interesting side effects it makes sense to explore. TurboGears tried to abstract a lot of response complexity through tg.response object and as there were not many reasons to override TGController.__call__ it was common that the response object body was always set by TurboGears itself. While this made sense for Pylons, where you are expected to subclass the controller to perform advanced customizations, it was actually something unexposed to TurboGears users. TurboGears made possible to change application behaviour using hooks and controller_wrappers. So the use for subclassing the TGController was actually strictly related to custom dispatching methods, which was usually better solved by specializing the TGController._dispatch method (tgext.routes is a simple enough example of this). This lead to a curious situation where the TGController needed to speak with TGApp through WSGI to make Pylons happy, so it needed to call start_response and return the response iterator itself. TGApp was supposed to be the WSGI application, but in fact most of the real work was happening into TGController, in the end we had two WSGI applications: both TGController and TGApp were callable that spoke WSGI. The 2.3 rewrite has been a great occasion to solve this ambiguity by providing a clear communication channel between TGController and TGApp by assigning each one a specific responsibility. In TG2.3 only the TGApp is now in charge of exposing the WSGI application interface. The TGController is expected to get a TurboGears Request Context object and provide back a TurboGears Response object. The TGApp will then use the provided response object to submit headers and response body. This has been possible without breaking backward compatibility thanks to the fact that the only subclassing of TGController common in TurboGears world was the BaseController class implemented by most applications. One of the interesting effects of this change is that your controllers are now enabled to return any instance of webob.Response. In previous versions it was possible to return practically only webob. WSGIHTTPException subclasses (as they exposed a wsgi_response property which was consumed by Pylons), so it was possible to return an HTTPFound instance to force a redirect, but it was not possible to return a plain response. A consequence of the new change is enabling your controller to call third party WSGI applications by using tg.request.get_reponse with a given application. The returned response can be directly provided as the return value of your controller. This behaviour also makes easier to write reusable components that don’t need to rely on tg.response and change it. Your application can forward the request to them and proxy back the response they return. Part #2 will cover Application Wrappers, which greatly benefit from the new response management. One of the new additions in TG2.1.4 has been the support for the so called pluggable applications, this is a really powerful and convenient feature that probably not enough TurboGears users started embracing. For people that never used them, pluggable applications provide a python package that can be installed and “plugged” inside any existing TurboGears application to add new features. Django has been probably the first framework to bring this feature to Python world and TurboGears implementation tries to be as convenient by making pluggable applications identical to plain TurboGears applications and providing a “quickstart-pluggable” command that creates the application skeleton for you. Pluggable applications can be installed using easy_install or pip and they can off course depend on any other pluggable application they need. This year, at EuroPython 2012, I have been pleased to present a talk about using TurboGears for rapid prototyping (both in Italian and English, you should be able to find the videos on EuroPython youtube channel), so I decided to dedicate a part of it to pluggable applications as they are actually the fastest way to rapidly prototype a project. With my surprise most the questions I received were about the EasyCrudRestController and not about pluggable applications. While the EasyCrudRestController is definitively a powerful tool, it’s far from being the answer to all the web developments needs. In most of the applications you are going to develop, users will probably prefer consulting content from something more engaging than an administration table of database entries. This month, to create a set of utilities that can help people with their everyday needs, I decided to ask guys that work with me to make every part of the web sites that they were writing as pluggable applications. The result of this experiment has been that most of the pluggable apps that I did in my spare time (tgapp-smallpress, tgapp-photos, tgapp-tgcomments, tgext.tagging and so on) ended being used in real world projects and started to improve exposing hooks and ways to customize their behavior for the project they were going to be used. After a few weeks, new pluggables like tgapp-fbauth, tgapp-userprofile, tgapp-calendarevents, tgapp-fbcontest, tgapp-youtubevideo has seen light and developing the target application started becoming blazing fast: Just plug what you need and customize it. Thanks to this our development process has really improved: whenever a developer finds a bug he just has to propose a patch for the target pluggable, whenever someone notices a missing index on a query he has just to add it to the given pluggable. All the websites under development improved like people were working on the same project. While existing pluggables might be limited, buggy or slow I’m getting confident that they will continue to improve, and some day they will surpass whatever custom implementation I can think of. I think I’m going to heavily rely on pluggable applications for any future project sticking to only one rule: “make it opensource”. This way, apart from probably helping other people, I’m also improving my own projects through other people feedbacks, bug reports and patches to the pluggables I used. So, next time you have to start a new project give a look at the TurboGears CogBin and check if there is a pluggable application that looks like what you need. If you find any issue or find space for improvements just fork it and send a pull request, or send an email on the TurboGears Mailing List I’ll do my best to address any reported issue thanking you for your feedbacks as I’m aware that you are actually improving any past and future project that relies on that pluggable. Today Sprox 0.8 got released, it is the first release to add ToscaWidgets2 support. Depending on which version of ToscaWidgets is available inside your environment Sprox will either use TW1 or TW2 to generate its forms. Being mostly a TW2 oriented release it might seem that not a lot changed since the previous version, but a little gem is hidden between all the TW2 changes as Sprox now supports setting default behavior for models themselves using the __sprox__ attribute inside model declaration. The previous code example makes Sprox use the Parent data field for selection fields when choosing the parent of Child entities. Apart from making easier to share options between your AddRecordForm and EditableForm __sprox__ attribute opens a great way to customize the TurboGears admin. By adding a __sprox__ attribute inside your models you will be able to change the TurboGears admin behavior without having to create a custom admin configuration. Setting __sprox__ attribute makes possible to change most sprox properties changing CrudRestController behavior, the same properties that are documented on sprox.org can be specified inside the __sprox__ attribute by simply removing the underscores. Recently I decided to give a quick benchmark for curiosity to the going to be branches of TurboGears2. I quickstarted a simple genshi based application (plain turbogears2 quckstart) and then I created a plain controller method without template, to avoid counting the template generation overhead. 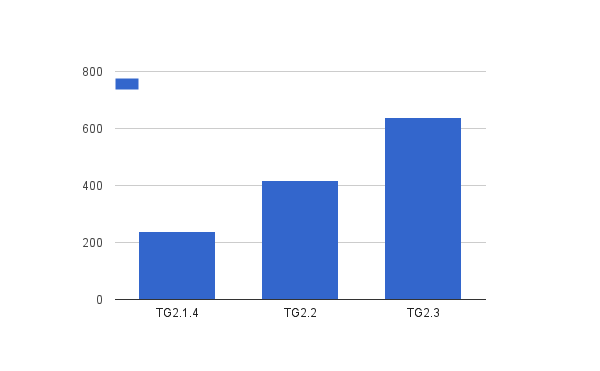 The following graph reports the resulting requests/second that my pc has been able to serve on each turbogears version. One of the key features of TurboGears2 is the great CRUD extension. Mastering the CRUD extension can really make the difference between spending hours or just a few minutes on writing a web app prototype or even a full application. The CRUD extension provides two main features, the CrudRestController which is meant to help creating totally custom CRUDs and the EasyCrudRestController which provides a quick and easy way to create CRUD interfaces. I’ll focus on the EasyCrudRestController as it is the easiest and more productive one, moving forward to the CrudRestController is quite straightforward after you feel confident with the Easy one. If you don’t already know how to create a new TurboGears project, start by giving a look at TurboGears Installation for The Impatient guide. Just remember to add tgext.datahelpers to dependencies inside your project setup.py before running the setup.py develop command. I’ll start by providing a Gallery and Photo model. To store the images I’ll use tgext.datahelpers to avoid having to manage the attachments. Using datahelpers also provides the advantage of having thumbnails support for free. Logging in with an user inside the photos group and accessing the /manage_galleries url we will be able to create a new gallery and manage the existing ones. To configure how the crud controller forms should appear and behave the __form_options__ property of the EasyCrudRestController can be used. This property relies on the same options as Sprox FormBase and customizes both the Edit and Add forms. The next part is probably to be able to upload some photos inside our newly created galleries. To perform this we will create a new EasyCrudRestController for gallery photos management. Mounting this inside the RootController as manage_photos = PhotosController(DBSession) it will be possible to upload new photos inside any gallery. 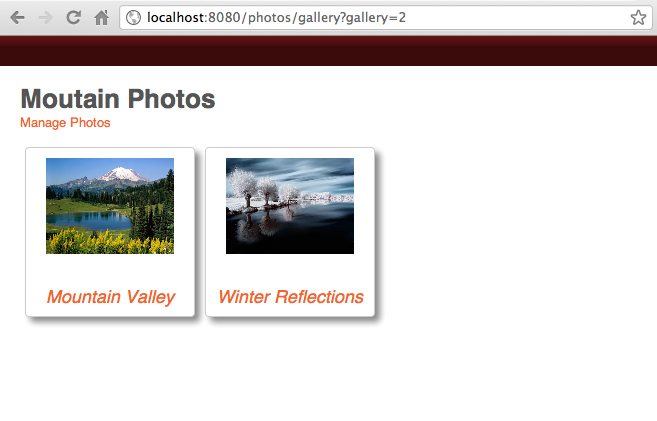 To manage the photos inside the first gallery for example we will have to access /manage_photos?gallery=1url. Each parameter passed to the EasyCrudRestController is used to filter the entries to show inside the management table and the keep_params option provides a way to keep the filter around. This makes possible to edit the photos of only one gallery at the time instead of having all the photos mixed together. Also when a new photo is created it will be created in the current gallery. The PhotosController got more customization than the GalleriesController, through the __field_widget_types__ and __field_validator_types__ options we force the image field to be a file field and using the __field_widget_args__ we ensure that the newly uploaded photos have the current user as the author. __table_options__ provide a way to customize the management table. The available options are the same as the Sprox TableBase and Sprox TableFiller objects. in this case we hide the indexes of the rows on the database and the gallery itself, as we are managing the photos of a specific gallery we probably don’t need to know which galleries the photos belong to. 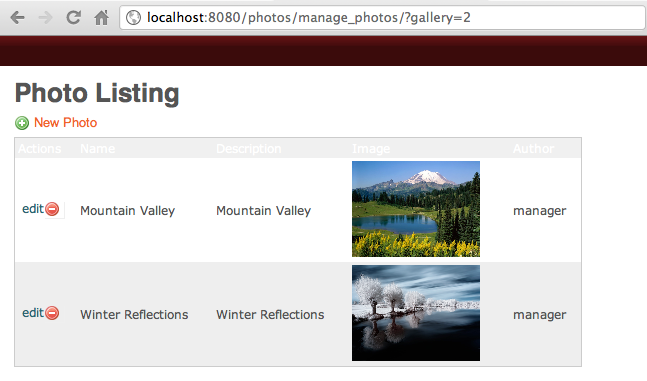 Using the __xml_fields__ we also specify that the image field provides HTML and so doesn’t have to be escaped. The image entry forces the table to show the image thumbnail for the image column of the table instead of printing the AttachedImage.__repr__ as it would by default. At first sight it might sound a bit complex, but once you start feeling confident, the CRUD extension makes possible to create entire applications in just a bunch of code lines. With just a few lines of code we created a photo gallery with multiple albums support and we can now focus on the index and gallery templates to make the gallery as pleasant as possible for our visitors. The complete implementation of the photo gallery is available as a pluggable application on bitbucket, feel free to use it in your TurboGears projects.